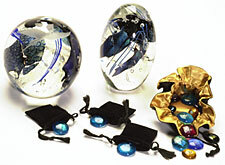 You may order any Companion Star, Parade Rest, or Faithful Friends Crystal designs solely as a work of collectible artglass. If you wish to incorporate cremated remains permanently within your artglass in order to transform them into memorials, please call or e-mail for complete instructions. Generally, cremated remains are forwarded in an airtight container via certified mail. You may also refer to the FAQs link for more information. Each order is given to the appropriate glass artist(s). It will take each artist six to eight weeks to produce your memorials, although frequently the timeframe may be less. The size of each memorial is measured from the base to the top, unless otherwise indicated. Because every Companion Star is created by hand, there will be slight variations in height and circumference. Shipping and insurance charges are governed by your choice of memorials, their weight, and the distance to their destination(s). Memorials honoring one individual may be shipped to several family members and/or friends at a variety of locations. 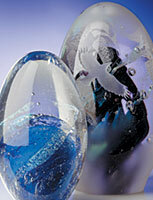 You may combine the cremated remains of two or more individuals in each of your memorials. For example, Sanctuary and Constellation designs are blown glass (hollow) and will display one or more Star Cluster ™ collections. When choosing Star Cluster collections, you may designate a color for each individual you wish to memorialize within Sanctuary or Constellation designs. Companion Star warranties against chips or cracks. Please call immediately upon receiving your memorials. You will need your tracking number when you call. Prices begin at $175 for pendants. Prices of other items depend on quantity and accessories. Please call or e-mail for further details. Payment in full is made at time of order. Companion Star accepts VISA and MasterCard. Illinois residents please add 6.75% sales tax.